Take A Break is a weekly British magazine that is aimed at women. It features real life stories as well as lots of competitions and crosswords etc. 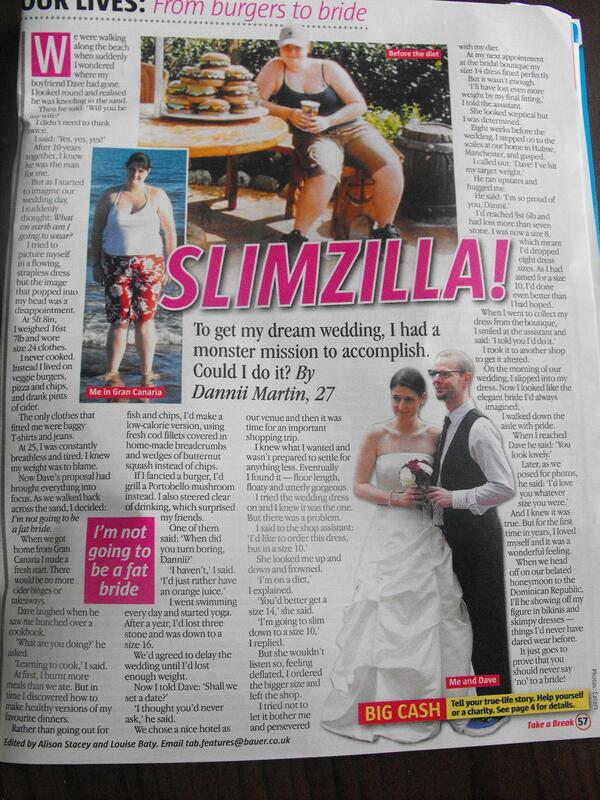 Again, focusing on the burgers, they used the subheading “From Burgers To Bride” and refereed to me as “Slimzilla”, but hey, what can I do?! This story was much more romanticised, and focused on how I was losing weight to being able to look good in a wedding dress. This wasn’t true. Don’t get me wrong, feeling great on my wedding day was one of the best bonuses I could have asked for, but I did this for my health and I always stated that. We also didn’t put off the wedding until I had lost weight. The wedding was about marrying the person I love. I would have done that if I was 20 stone. But, again, I guess it made a better story to say that I was doing it because I wanted to look good. The article also made out as if I was allergic to cook books or something. I have always cooked, just not the healthiest of meals haha. What I liked about this article was that they actually asked me the kind of food swaps that I made. These articles can be great for inspiring other people to become healthier by seeing the before and after photos, but that is no good unless you can actually read how they did it and the day to day changes they made. So I was happy that they included my healthier burger and fish and chip ideas.